[Jesus said,] "If the world hates you, remember that it hated me first. The world would love you as one of its own if you belonged to it, but you are no longer part of the world. I chose you to come out of the world, so it hates you. Do you remember what I told you? 'A slave is not greater than the master.' Since they persecuted me, naturally they will persecute you. And if they had listened to me, they would listen to you." Hate! We don't like that word, do we? Especially when we are the target of hate. 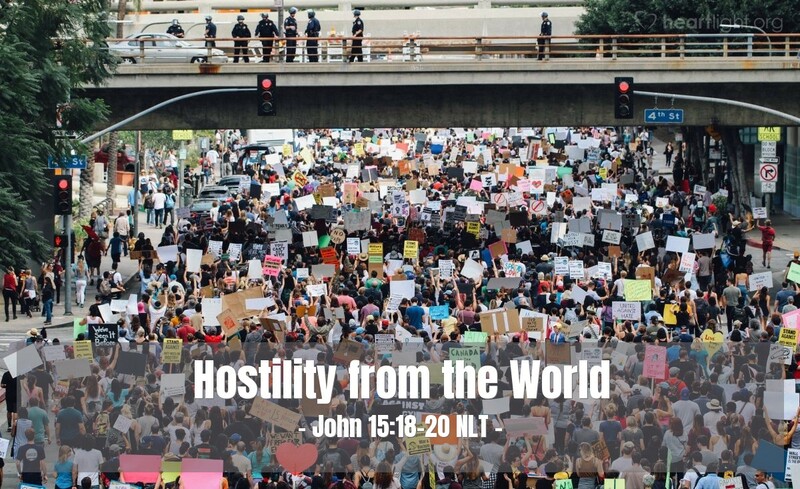 Yet those who are disciples of Jesus must realize that their hero was unjustly murdered by those who rejected him because of jealousy, hate, misunderstanding, and rivalry. Some of us will follow in his steps. Some, even to martyrdom itself. Our hardships and difficulties do not invalidate Jesus' call. Neither do they invalidate our ministry. These problems are a reminder that there is a spiritual battle for every human heart. Satan will do all he can to silence our voices when we are the ones who bring God's salvation. Father, please make me more aware of your servants who are facing persecution and hardship today. Give me the courage to stand for your truth and live your ethics even if those values cost me ridicule or rejection. Please let your glory be praised in my life, whether I find myself in hardship and persecution or in good times and acceptance. In Jesus' name, I pray. Amen.